Think back to when you took a test for a college entrance exam or a test that decided whether you would get an important job or position that you coveted. Thinking produces anxiety because of the degree of importance placed on it by others and ourselves. For kids with emotional disturbance or autism, this anxiety can become overwhelming. Therefore, what we have to do in order to help kids cope is to change their thinking about the test. This does not mean that we should pretend it isn’t important, or that kids should just coast through it aimlessly. It does mean, however, that we should try to get them in the mindset of just doing their best without putting themselves into a frenzy if they don’t get every answer right. He went on to explain that this is what causes a great deal of anxiety in a number of situations. He proposed instead, to eliminate anxiety, to change how you think to a kind of focused resolve to do the best you can do in any situation, and then forget the rest. So, when you talk to kids about testing, remind them that it is not the end of the world if they do not do well on the tests. The test is important and you should be concerned about it, but worrying about it just creates more anxiety and this can only produce the opposite effect to what is desired. Another effective means of dealing with test anxiety with kids is to teach them visualization skills. This behavioral therapy employs the use of mental exercises that help mentally remove the person from the current stressful situation to a place that makes them feel calm and serene. For example, you can teach students to briefly close their eyes and imagine an ocean beach scene, a family picnic or a pet they love to play with instead. This focused approach to introducing something pleasant in the face of something stressful can help many kids to regain their composure and avoid extreme anxiety during the testing (or in other anxiety-provoking situations). Exercise produces endorphins, and it is a very good way to reduce stress. Some testing sites allow students to run, jump up and down or do calisthenics between test sessions. This is good because it not only loosens up their body, but also helps them increase circulation and energy levels before the next test. If your test site does not allow this, you may want to suggest it and provide some research that illustrates the benefits of brief exercise between sessions. 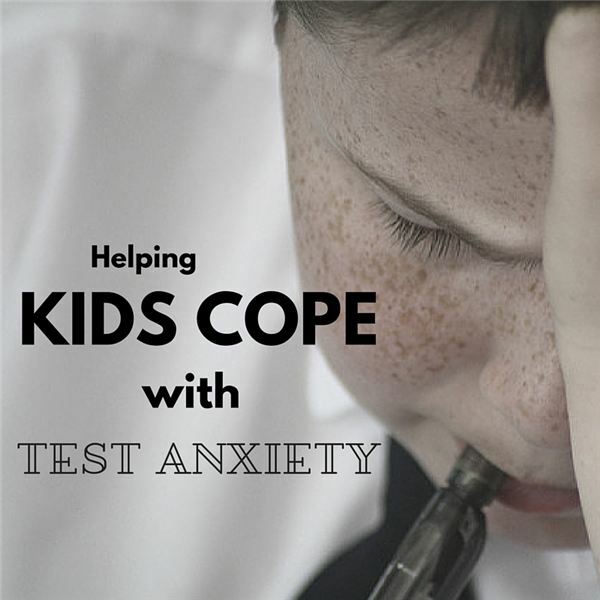 One way to help kids cope with anxiety in the tests is to talk to them the morning of the test and remind them of some of the things we talked about in this post. Remind them that the test is not their “make or break point” in life, that life will “go on” even if their scores are low, but that it is just an important piece of data that we learn their strengths and weaknesses from. Finally, remind students that test taking is not just inherent in the school environment. Rather, it is something that they are going to encounter in any career or profession they go into. Even once they are well established in their career, there will be many times when they will be required to continue their training or improve their skills and there may even be tests of some sort to assess that knowledge so that they can improve their rank in their careers. Also, don’t forget that kids with autism, anxiety disorders, or other disabilities may be allowed to take frequent breaks as needed during the test or have their tests further modified. Check with your school’s 504 or Special Education program for details on qualifications if your child is not yet receiving these services. We hope these tips will help as your child takes their standardized tests, not only this year, but also throughout their school days, and that it will help them prepare for life as well, by giving them coping skills as they face the challenges ahead of them.